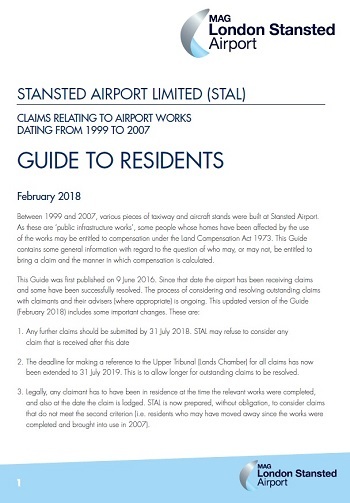 On this webpage you will find public announcements made by Stansted Airport Limited (STAL) relating to claims relating to airport works dating from 1999 to 2007. You can also access additional information including the “Guide to Residents”, which includes additional information regarding the claims process. Click on the image below to download “Guide to Residents”. On 9 June 2016, STAL published a notification regarding claims for compensation in relation to airport works dating from 1999 to 2007 under Part 1 of the Land Compensation Act 1973 (referred to as Part 1 claims). A related ‘Guide to Residents’ was published providing further information. A deadline of 31 July 2018 was specified for claims to be referred to the Upper Tribunal (Lands Chamber) in the event claims could not be resolved by agreement before that date. Since June 2016, STAL has received claims from local residents and the process of considering and resolving those claims is ongoing. The deadline for making a reference to the Upper Tribunal (Lands Chamber) for all claims has now been extended to 31 July 2019. This is to allow longer for outstanding claims to be resolved. Legally, any claimant has to have been in residence at the time the relevant works were completed, and also at the date the claim is lodged. STAL are now prepared, without obligation, to consider claims that do not meet the second criterion (i.e. residents who may have moved away since the works were completed and brought into use in 2007). The Guide to Residents has been updated to reflect these changes. It is available at stanstedairport.com/compensation or from the address below. The ‘Guide to Residents’ contains supplementary information about the claims process. This announcement and the Guide may be subject to future change and the information provided is not to be regarded as a substitute for professional advice. 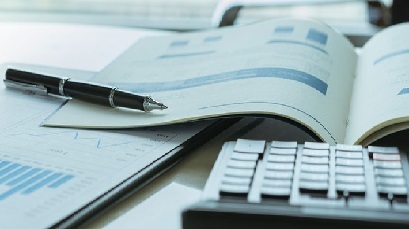 STAL recommends that individual claimants take independent professional advice. The information STAL requires is set out in the “Guide to Residents” which can be found here or obtained from the address above. 2. If the property to which a claim relates does not fall inside the area identified in the “Guide to Residents”, STAL believes it is unlikely the claim will attract compensation. 3. If the property to which a claim relates does fall inside the area identified in the “Guide to Residents”, there remains the requirement for the individual bringing the claim to demonstrate it has legal merit. 4. As the Compensating Authority, STAL may or may not be able to agree whether any compensation is owed to an individual claimant or the amount of any compensation which may be due. In those cases, please note STAL will only regard the claim in question as having been made "in time" if it has been referred to the Upper Tribunal (Lands Chamber) by the individual claimant no later than 31 July 2018. The “Guide to Residents” contains supplementary information about the claims process. It is not to be regarded as a substitute for professional advice. STAL strongly recommends that individual claimants take independent professional advice. 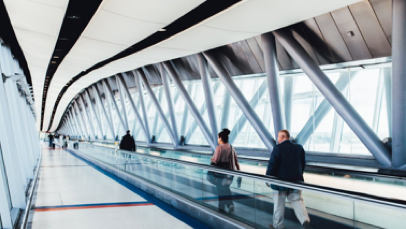 STAL recognises that there has been some uncertainty in recent years about the status of compensation claims relating to development works carried out at the airport in the 1999-2007 period. Having reviewed the matter thoroughly, and in light of two recent legal decisions, STAL has decided to clarify the status of these claims to remove any uncertainty for local residents. The relevant legislation is complex but, broadly, the owner of a residential property, at the time of the works, is entitled to compensation if they can show that the value of their house has been reduced as a direct result of those works and provided they bring their claim “in time”. STAL confirms it remains willing to consider claims from qualifying residents and will, for the time being, treat them as having been made “in time”. This means that residents who believe they may be entitled to compensation can now submit a claim. Of course, residents will still have to show that their claims have legal merit. STAL will announce more details on the process to be followed shortly, including the specified period for lodging claims which will be of sufficient duration to allow residents to take professional advice. STAL will also be discussing these issues with the Stansted Airport Consultative Committee.